So Cal Track Club's Jody Hawkins smashed her own American indoor record in the 3,000 meters, clocking 9:51.60 while running in a collegiate meet, the Texas A&M Invitational, Jan. 16. Jody, 43, lowered her AR time of 9:56.24, which she ran in 2007. She finished third in the race, behind two college runners. Jody told Masters track blogger Ken Stone that she hopes to make a run at the single-year American record for 43-year-olds in the 5K (16:43), possibly at the Carlsbad 5000 on April 11. Congratulations, Jody! Nolan Shaheed, an original So Cal Track Club member, Masters Track Hall of Famer and host of our club's annual Awards Dinner, has rebounded from the disappointment of missing last summer's Worlds due to injury. Nolan shattered the M60 indoor mile record Saturday in clocking 4:57.06 at the annual Hartshorne Mile at Cornell University in Ithaca, N.Y.
Before taking aim at the outdoor M60 record of 4:54.07, run by Dutchman Joop Ruter in 1993, Nolan will focus on lowering his new indoor record at the Indoor World Championships in Kamloops, B.C. Our teammates Lisa Valle and Christine Reaser ran very well in their section of the Hartshorne Mile. Lisa ran 5:12.39 to take third among the W40s, followed by Christine in seventh and 5:37.20. Congrats to Christine Reaser, winning the New England Masters 6k Cross Country Championships on the weekend. Christine (W43) won in 24:23. Attempting to win two world track titles in the same championships is a formidable barrier. Valle surmounted that barrier in winning the women's 40-44 division of the 800 and 1500 meters at the WMA World Championships, July 28-Aug. 8 in Lahti, Finland, the first American woman in the 40-44 age group ever to pull off that double. But then she had to face the real barriers. Valle, a 43-year-old high school teacher from Albuquerque, N.M., edged a German rival by inches to win the 2,000-meter steeplechase in an age-group world-record time and earn her third gold medal at her first Masters world championships. Valle began running the steeplechase only this past spring. She needed her speed to edge the runner-up by 0.04 seconds, running a record-setting 7:01.95. Valle ran 4:34.82 in winning the 1500, missing the American record by about 2 seconds. She opened with a gold-medal-winning effort of 2:18.17 in the 800. She then climaxed one of the best performances in history by an American woman Masters athlete by anchoring the U.S. 4-by-400 relay team to a bronze medal, bringing the Americans from fifth place to third on her final leg. Valle showed she was ready for a big effort at the Worlds when she won the 800 and steeplechase and took silver in the 1500 at the USA Track & Field Masters Outdoor National Championships in Oshkosh, Wisc., earlier in July. The American contingent in Finland finished third in the overall medal standings, with 147 medals, including 63 gold. The host Finns ran, threw and jumped away with the most medals – 319 – including 102 gold. The 17 SoCal Track club athletes brought home 26 medals – which if they were a country would have ranked them18th of 67 nations at the World Championships. Terrance Spann, running in the M35-39 division, captured his first world title, winning the 400 meters in 48.14. Terrance dominated the event, winning each of his races – quarter, semi and final. Brian Sax had a stellar performance in the M35-39 800, dropping from a seasonal best of 2:02 to 1:59.03 in the final to win silver. Sumi Onodera-Leonard, several times a world champion, captured medals in the W80-84 divisions of the 100/200/400/800, plus added a relay gold. David Ashford was the M45-49 silver medalist in 110 hurdles and anchored the U.S. M45-49 4-by-100 relay to gold with a dive at the finish line that sent him to the hospital with a fractured arm. Mark Cleary picked up a team bronze in the M50-54 8K cross-country race. SoCal Track Club's race-walk contingent also performed exceptionally. Carl Acost earned team gold and silver and two individual silvers in 5K and 10K race walks. Miriam Gordon, W80-84, won two Individual silvers in the 5K and 10K race walks. Jolene Steigerwalt, W65-69, won an individual bronze in the 10K and silver in the 20K, plus a gold and silver team medal. So Cal's Rick Easley won a relay bronze in the M55-59 4-by-100 and qualified for the final in the 400 and javelin. Pete Hlavin narrowly missed bronze in the M50-54 high jump. Ralph Fruguglietti was fourth in the M50-54 discus. Barry Givens was fifth in the M35-39 3K steeplechase. Tom Patsalis, M85-89, was sixth in the triple jump. 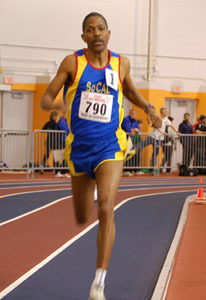 Julio Reyes overcame an injury to make the final in the M50 400.